You might wonder if wiccans wear makeup every day. Many don’t however many do. Wiccans strongly reject purely superficial beauty and those who embrace it. They do however, embrace uniqueness and natural beauty. There is absolutely nothing wrong with the utilization of makeup to enhance ones physical appearance. Don’t be afraid to let your inner goddess shine through. The right amount of makeup can protect your skin from harmful elements as well as make you look years younger. 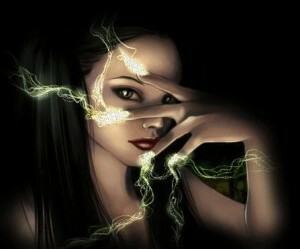 I prefer to envision wiccan goddesses as beautiful and ethereal. Natural and organic makeups have exploded in popularity in recent years. It used to be that only boutique lines such as Bare Minerals and Sheer Cover were available. Nowadays however, mineral makeup can be found as part of many major makeup brand lines. Mineral makeup brands are natural cosmetics and they can do wonders to help even out the skin tone and bring a smooth appearing serenity to your face. Not only that, by applying a uniform natural colored mineral foundation, your seductive features such as your eyes and lips, will be better showcased. The loose powders go on easily with a brush and give you a natural even foundation. There are plenty of pure and organic makeup up brands which can alleviate ones concerns about wearing synthetic makeup with harmful chemicals. If you’re willing to cast a love spell then surely you are willing to use organic products including creams and powders to enhance your natural appearance. Your natural beauty is a absolutely pure means of attracting the object of your affection. Natural make ups remove many of the classic skin irritants such as dyes, talc, and preservatives from their formulations. While they don’t replace sun screen, organic makeup with added SPF can often add a modicum of extra protection from the suns harmful rays. Some wiccans wear strong makeup and heavy jewelry, and some wear no makeup and go completely natural. I’ve read articles about how many wiccans are generally overweight and of pale complexion. Not true! And some rumors claim that if they do use makeup, it’s white based powder to make them look even paler than they are! Gothic style fashion is definitely an incorrect generalization about wiccans. Perhaps younger ones wear makeup and jewelry to make a social statement. But most wiccans look like regular people and if anything what they share are similar beliefs but not so much similar fashion sense. I’d say that most wiccans want to look naturally beautiful and blend in perfectly to their environment. They prefer a natural goddess look. Natural organic makeup in earthy colors can help you beat tired skin, pale skin, acne skin, and mature skin that has tiny wrinkles developing. Combine that with a healthy diet and lifestyle and a strong sense of inner peace, and you won’t need a love spell to attract men. Most men like a woman who wears only a moderate amount of well-blended in makeup that enhances her natural beauty but does not overwhelm it. They do not like an overly obviously makeup up look or caked on heavy makeup. The do appreciate a beguiling goddess who is fearless and can bewitch her man by embracing her playful, glamorous side. When you apply makeup, search for organic brands and apply it in moderation to enhance your natural beauty.